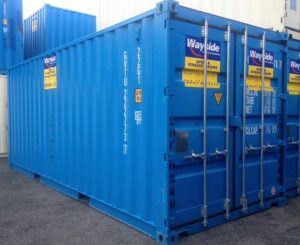 Wayside’s 20 foot storage container is our most popular model. They are heavy duty steel construction with swing doors, a wooden floor, and a whole variety of options. We have tunnels, which have doors on both sides of the unit. Whether it be for residential or commercial use our 20 foot containers can be customized to fit your specific needs. But the customization doesn’t end there! Check out Custom Container page to see a few of the many ways we can transform your container. Call today for delivery tomorrow!